Join I Paint Today this Sunday Evening at 6:30 pm for a very special Paint and Pamper Party. 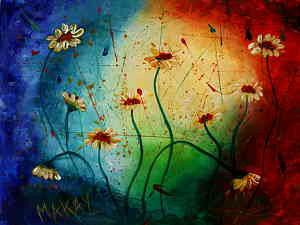 The artwork for this event will be this gorgeous Vibrant Daisies painting. Each lady will receive a FREE MARY KAY FACIAL while we paint these beautiful daisies! Take some time out of your busy schedule to pamper yourself and have some fun. No experience necessary. We provide all the painting supplies, you just need to show up. Snacks, bottled water and coffee will be available for free so you can kick back, eat, drink, be pampered and paint. It’s time to relax and treat yourself. You Matter! !